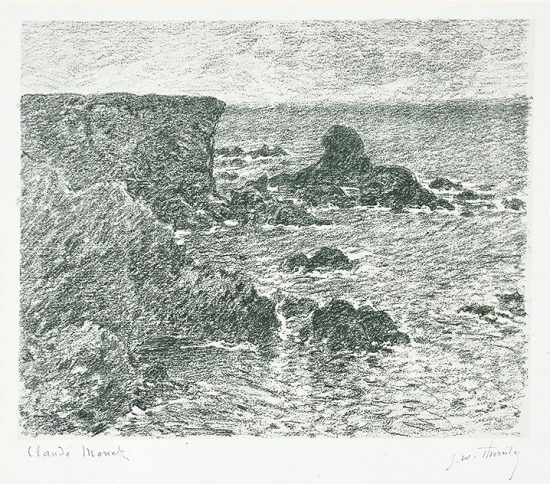 From an edition of 25 hand-signed proofs by both Claude Monet (Paris,1840 - Giverny, 1926) and engraver G.W. Thornley. 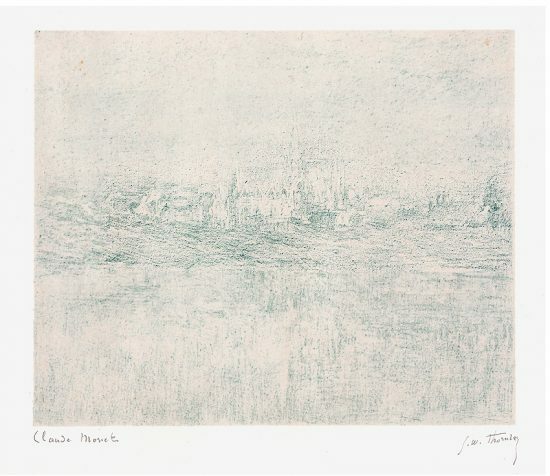 This work is hand-signed by Claude Monet (Paris, 1840 - Giverny, 1926) in pencil in the lower left margin; also hand-signed by the engraver G. W. Thornley in pencil in the lower right margin; also containing Thornley’s red ink stamp in the lower right recto. Claude Monet Port Domois á Belle-île (Port Domois at Belle-Isle), 1894 is a landscape looking down from a cliff towards the powerful sea off the coast of Brittany. 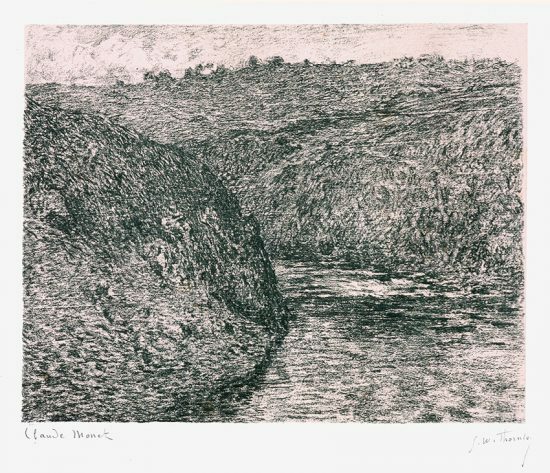 In the foreground to the left and right of the composition is the land on which Monet was standing. Just in between the two jutting landmasses is a rock, being pummeled by waves, powerfully drawn with whitecaps. In the background is another coast of steep cliff-faces. The water is drawn so expertly that it looks as though it is splashing around amongst the rocks. Alternating the use of white for the foam, and shadow, the waves seem to come alive. 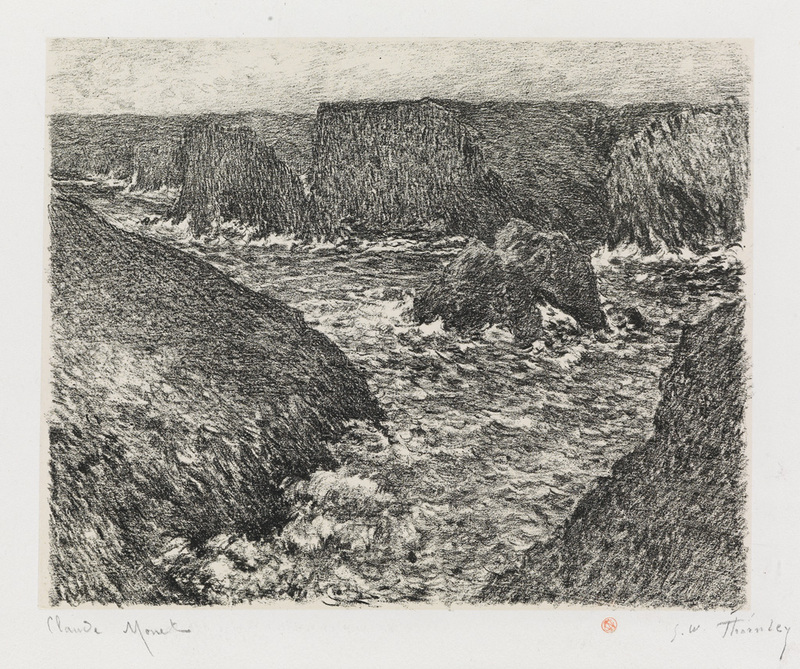 Created in 1894 after an original painting titled Port Domois á Belle-île (Port Domois at Belle-Isle) created in 1886, this color lithograph on chine appliqué is hand-signed by Claude Monet (Paris, 1840 - Giverny, 1926) in pencil in the lower left margin; also hand-signed by the engraver G. W. Thornley in pencil in the lower right margin; also containing Thornley’s red ink stamp in the lower right recto. 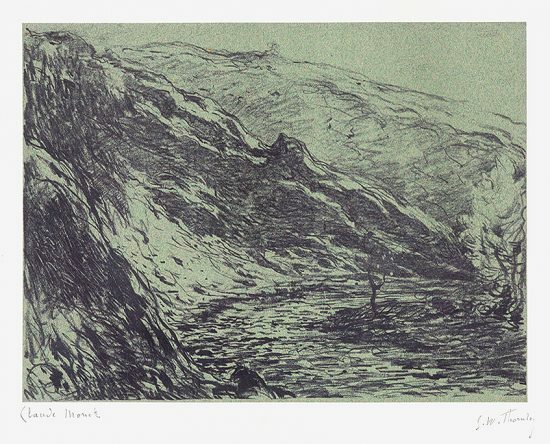 From an edition of 25 hand-signed proofs by both Claude Monet (Paris, 1840-Giverny, 1926) and G.W. Thornley; printed by Belfond & Cie and published by Goupil, Paris. 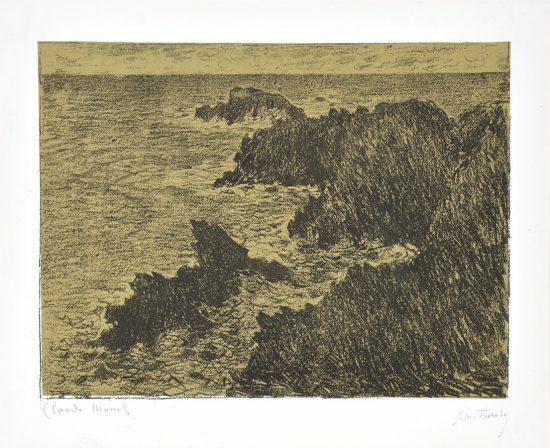 Claude Monet Port Domois at Belle-Isle (Port Domois á Belle-île),1894 is fully documented and referenced in the below catalogue raisonnés and texts (copies will be enclosed as added documentation with the invoices that will accompany the sale of the work). 2. Wildenstein, Daniel. Monet or the Triumph of Impressionism: Volume III. Paris: Wildenstein Institute, 1996. 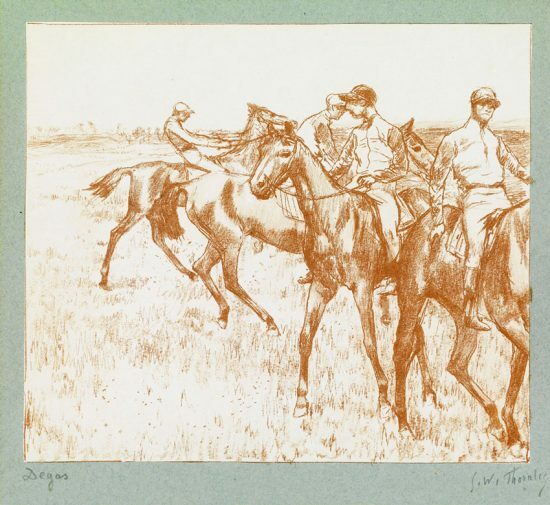 Original painting of this work listed and illustrated as catalogue no. 1109. Framed to museum-grade, conservation standards, Claude Monet Port Domois at Belle-Isle (Port Domois á Belle-île), 1894 is presented in a complementary moulding and finished with silk-wrapped mats and optical grade Plexiglas. Claude Monet is regarded as the archetypal Impressionist in that his devotion to the ideals of the movement was unwavering throughout his long career. As the master of impressionism his artworks appeal to all. 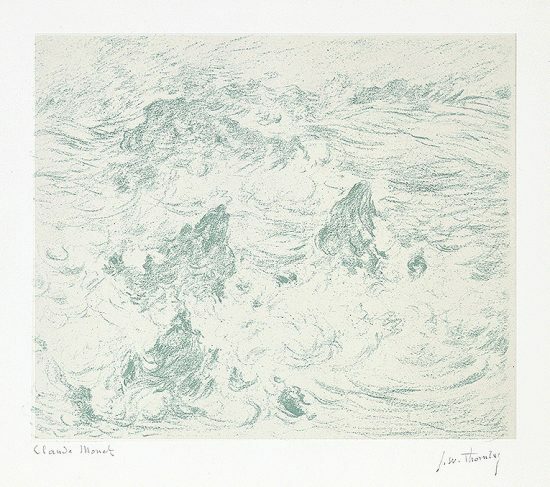 View our collection of Claude Monet prints and paintings for sale. Sell your Claude Monet fine art with us. We offer free evaluations.